In follow-up to this year’s SFC, you can find all presentations, speeches, pictures and other information about the conference on the Intranet. More will follow as it becomes available. 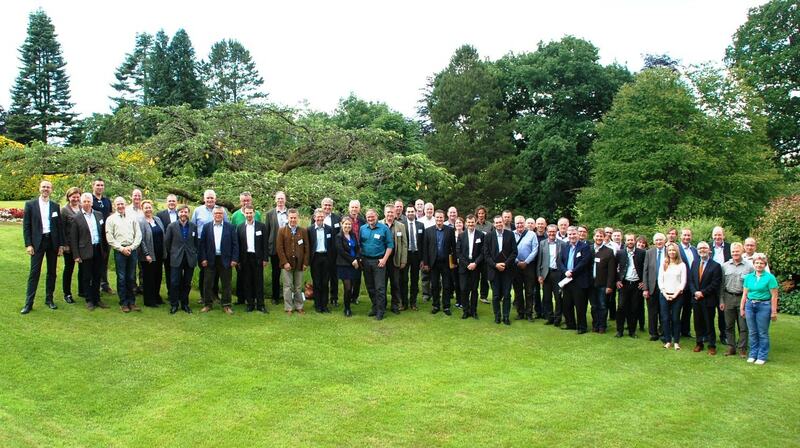 The conference was hosted on 21-23 June by the Forestry Commission in England’s beautiful Lake District, a perfect location to talk about “Forest Management for People, Nature and Economy.” Our thanks go to the entire team of the Forestry Commission for organizing this great event! 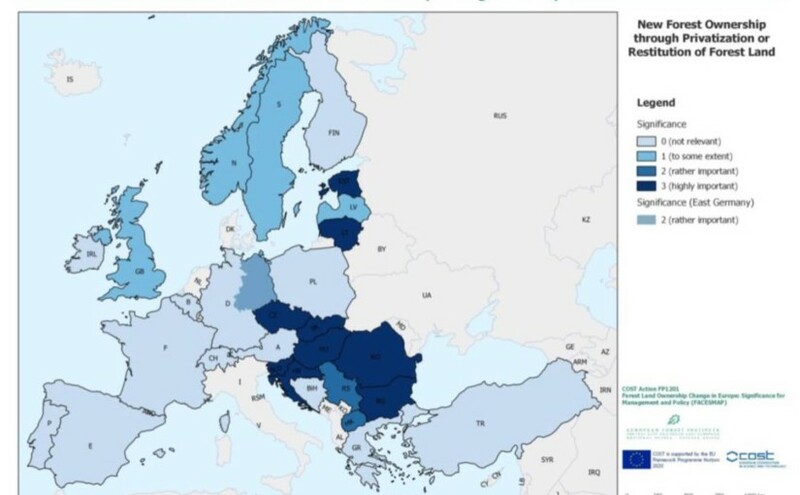 So far as we know: 30 % of the forest area in the EU is state-owned, 60 % is privately-owned and 10 % is owned by municipalities or local communities. But what does the forest ownership structure look like in detail, how and why is it changing and what are the conclusions and recommendations for forest-related policies, forest management practice, further education and future research? Does the growing number of “new” forest owners who own only small parcels, have no agricultural or forestry knowledge and often no capacities or interest to manage their forests, mean new management approaches are required? 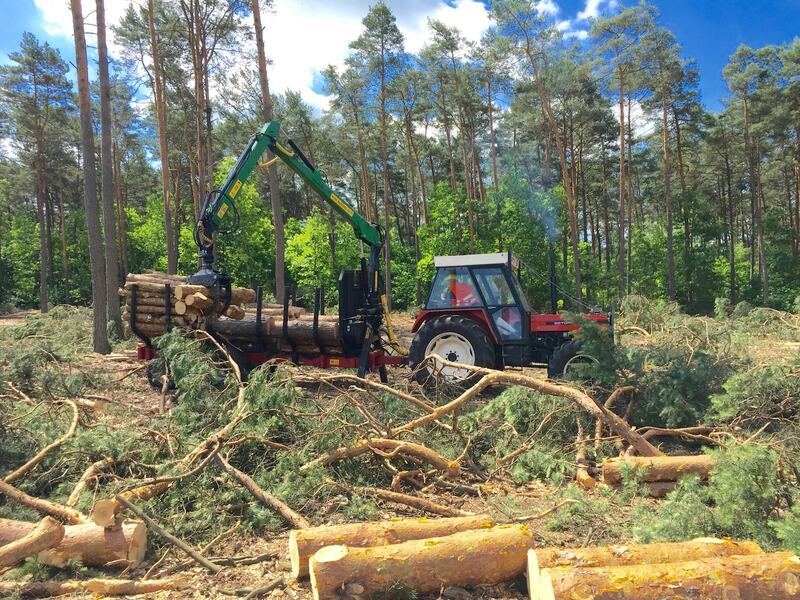 How will Europe’s changing ownership structure affect the forestry sector? These are some of the questions that have been the focus of the “Forest Land Ownership Changes in Europe: Significance for Management and Policy” Action (COST Action FP1201 FACESMAP). Although the COST Action wants to analyze all kinds of ownership changes their special interest lies in non-state forms of ownership. Nevertheless, some primary outcomes also concern state forest ownership and State Forest Management Organizations. 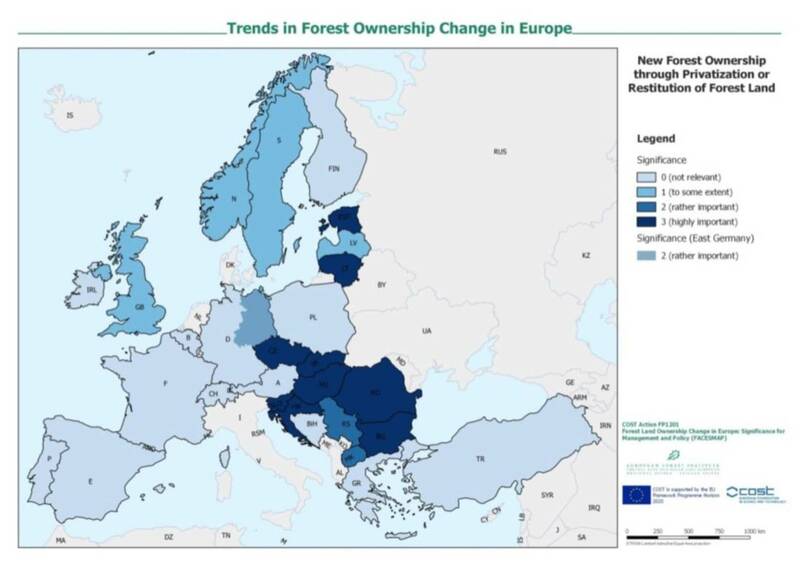 The restitution of forests in central, eastern and southeast Europe is still ongoing and has caused profound changes in forest ownership structures in most countries in these areas of Europe. The share of private forest owners rose in many countries from zero to more than 40-50 % in countries such as Lithuania or Romania. The privatization of state forests has also taken place in other countries of European such as Norway, Sweden and the UK, but on a much smaller scale. In 21 out of 28 European countries there are restrictions in relation to selling state forests. In Bosnia and Herzegovina, for example, it is strictly forbidden to sell state forest land whereas in Croatia publicly owned forests cannot be sold but they can be rented out under long-term leases. Besides the “traditional” public and private forest ownership types, some more intermediary types were identified. One type was called “third sector ownership.” Social, environmental or other non-profit organizations increasingly acquire forests for special management objectives, often in the public interest. Another new type of ownership, at least in Europe, is investment funds which purchase forest land for intensive management and then market shares of these forest funds to private investors. When it comes to the motives and behavior of forest owners there is an increasing diversity. In the past, the “typical” private forest owner was mainly rural-based, was often a farmer and active in his forest, which was usually located close to his residence and used to produce an income or at least provide his own fire wood. The “new” forest owner type is much more diverse with very different motivations and goals. To own a forest is sometimes part of a life style. More and more forest owners live in urban areas and appreciate the immaterial values of their forest. This may explain why income and subsidies ranked pretty low among the objectives of private forest owners in the assessments. Some State Forest Management Organizations are charged with providing advisory services for private and/or municipal forest owners, making it important for them to be able to understand the motivations and objectives of a very diverse group of non-state forest owners with needs which can differ from their own. A problem concerning forest ownership that was made apparent during the workshop were the different definitions and methodologies used to explain forest owner types. For example, municipal or church forests are considered to be private forests in some countries, but public in others. It is especially difficult to find the right translation for some historical private and common forest ownership types when these exist only in certain countries. The Final Conference of the COST Action FACESMAP will take place on 7-9 September 2016 in Vienna. More information about the outcome of the Action can be found in the Country Reports and at the FACESMAP website. EMPHASIS (Effective M anagement of Pests and Harmful Alien Species: Integrated Solutions) is carrying out a survey on the management of threats to plant health to understand and investigate further the current needs of end users in terms of their key pest threats, solutions applied and shortcomings of available technologies throughout the EU. One target group of the survey is professional organisations in the forestry sector. The survey will remain open until the end of July and is available in 5 languages (English, Français, Deutsch, Español, Italiano). EMPHASIS is a project funded by the European Union’s Horizon 2020 research and innovation program. It aims to fight threats from native and alien insect pests, pathogens and weeds that also damage natural ecosystem services by developing integrated mechanisms of response measures to predict, prevent and protect agriculture and forestry systems. In June it organized a stakeholder workshop to foster investment in integrated pest management strategies. 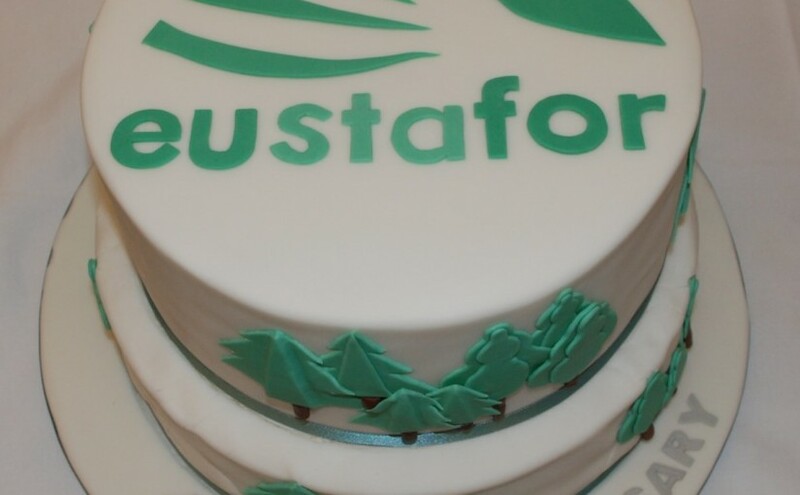 EUSTAFOR took part in the workshop as the only organization from the forestry sector. In 2015, in its Energy Union strategy, the Commission announced that it would come forward with an updated bioenergy sustainability policy, as part of a renewable energy package for the period after 2020. 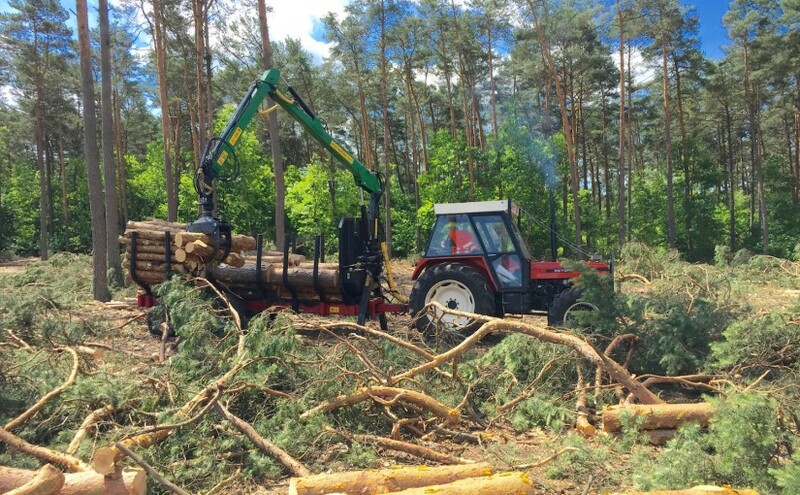 The new EU bioenergy policy post-2020, including the sustainability of biomass from forests, is one of the most important current policy developments relevant to forests and forestry in the EU. The Commission is working on a new bioenergy policy as a part of the Energy Union. A Public consultation was due until 10 May 2016 to gather views from stakeholders. EUSTAFOR provided its contribution to this public consultation. Representatives of the European Commission (DG ENER) clearly state that biofuels will play a significant role in the future bioenergy policy and the major gap to cover is the lack of sustainability criteria for solid biomass for bioenergy (the sustainability of biofuels and bioliquids have already been covered by the current Renewable Energy Directive). Following the Report of the Ad-hoc Working Group of the Standing Forestry Committee on Sustainable Forest Management Criteria & Indicators, in which a risk-based approach was mentioned as a possible way forward to provide an assurance of the sustainability of forest biomass, DG AGRI set up an informal expert group (EG) to further develop a risk-based approach as a possible solution for the sustainability issue of solid biomass. The meeting of the EG took place on 27 April 2016 and was attended by representatives of international and non-governmental organizations in the forestry and energy sector including, among others, certification schemes (FSC and PEFC), the paper industry, private forest owners, European biomass associations, energy holdings, NGO’s and EUSTAFOR. Mr Damian Zielinski from Lasy Panstwowe (Poland) represented EUSTAFOR at this meeting based on an invitation by DG AGRI. The memo from the meeting is available on EUSTAFOR’s Intranet under this link. As part of the preparation for this policy initiative, the Commission held a stakeholder meeting on 12 May 2016 to discuss relevant aspects of biomass sustainability with stakeholders. The agenda and presentations delivered at this meeting are available under this link. Currently the Commission is working on the Impact Assessment and its Communication to the Council and the European Parliament with a legislative proposal expected by the end of 2016. In the context of the Commission’s ongoing work on this portfolio, Politico published a Special Report addressing the role of renewables in the EU bioenergy policy. Chapter 3: “Trees are green, but burning them isn’t” discusses the use of biomass from forests in bioenergy generation and challenges the carbon neutrality of woody biomass. Read the Report under this link. Having been formally adopted by the group, both documents will be transferred to the relevant Commission services. The CDG also exchanged views on the Bioenergy Sustainability Policy, the review of the Bioeconomy Strategy and the results from the Eurobarometer campaign. Information points included the European Commission’s conclusions on the Final Report on the implementation of EU Timber Regulation, on the follow-up of the EU Forest Strategy and the Multiannual Implementation Plan (MAP), two research studies on “The optimised cascading use of wood” (DG CROWTH) and on the “Carbon impacts of biomass consumed in the EU: quantitative assessment” (DG ENER) as well as on the list of Invasive Alien Species, recently revised by the European Commission. All documents and presentations relevant for this meeting are available on EUSTAFOR’s Intranet under this link. CDG is a consultative and advisory body to the Commission’s DG Agriculture and Rural Development. It is composed of stakeholders from the private sector and broader society. EUSTAFOR holds two seats in the CDG and is represented by Mr. Martin Lindell (Sveaskog) and Mr. Piotr Borkowski, Executive Director. 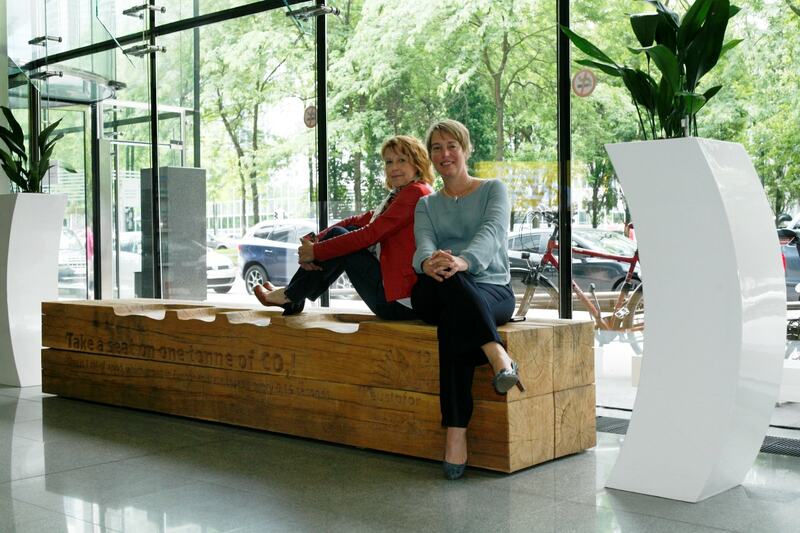 The “1-tonne bench” made off 1 m³ solid oak wood, received from its Latvian member LVM on the occasion of EUSTAFOR’s 10th anniversary, has found a new home. 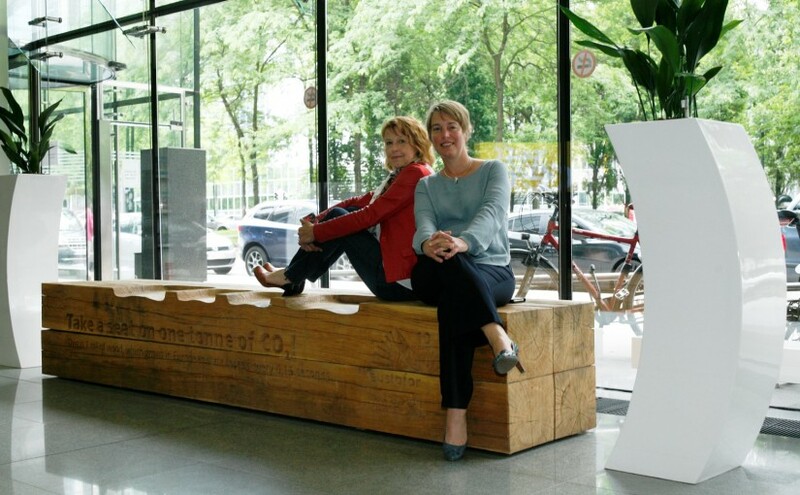 After being displayed for 10 weeks in the core of the European District of Brussels as part of the “Forest City Project”, it has now been relocated to the Ministry of Environment, Agriculture and Urban Planning of Flanders. At the Headquarters of Natuurinvest, EUSTAFOR’s Flemish member, it is apparently receiving a lot of interest and appreciation by visitors. 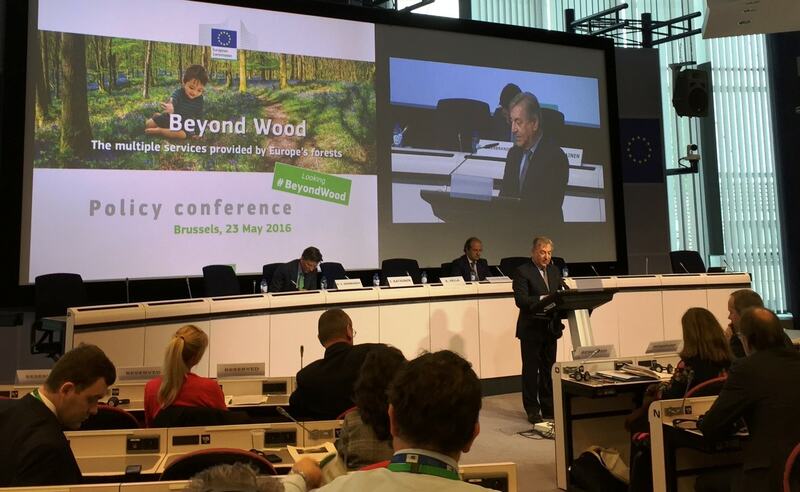 As a reaction to the speech of Commissioner Karmenu Vella at the conference “Beyond Wood: The multiple services provided by Europe’s forests,” the European State Forest Association (EUSTAFOR) signed a joint letter from six organizations representing private and public forest owners and managers which reacts against the Commissioner’s depiction of forest owners and managers as only seeking to maximize profits and lacking knowledge of and interest in other aspects of multifunctional forestry. Mr. Vella, European Commissioner in charge of Environment, Maritime Affairs and Fisheries, spoke at a conference which he hosted jointly with Jyrki Katainen, European Commission Vice-President for Jobs, Growth, Investment and Competitiveness. The conference took place on Monday, 23 May 2016, in Brussels. In his speech, Mr. Vella drew a picture of European forests that was mainly based on the “State of Nature in the EU” report published in 2015 by the European Environment Agency and according to which Europe is continuously losing forest habitats and biodiversity whereas forest owners and managers are focusing mainly on maximizing their profits. Commissioner Vella neglected the fact that multiple benefits provided by European forest owners and managers to society at large can only be derived from multifunctional and sustainably managed forests and that balancing the economic alongside the social and environmental dimensions of forests is of key importance. The signatories of the joint letter stressed that active management of forests has a more crucial role than ever to play in contributing to the EU’s objectives of ensuring sustainable development, maintaining and creating jobs and growth in the EU and decarbonizing the economy. EUSTAFOR does not share Mr. Vella’s gloomy depiction of the status of European forests. There is much evidence produced by other sources, such as the “State of Europe’s Forests 2015” report, that provide a very different picture, one which is more consistent with the everyday experience and assessments of European state forest managers. According to these sources, Europe’s forest area is growing, the quality of Europe’s forests is improving and they contain more mixed stands, protected forests and deadwood. In addition, over 90 % of Europe’s forest area is covered by semi-natural or undisturbed forests. Mr. Vella’s speech was also criticized by ten Members of the European Parliament, led by MEP Elisabeth Köstinger. In their joint letter, they described Mr. Vella’s assumptions as “beyond reality” and invited him to support a more holistic approach to European forest policy. European State Forest Management Organizations (SFMOs) practice sustainable and multifunctional forest management and wholly support the pan-European definition and principles of sustainable forest management developed by FOREST EUROPE. SFMOs have committed themselves to the objectives and guiding principles of the EU Forest Strategy! Postscript: Mr. Vella responded to the joint letter on 12 July 2016 (link). The Future of forests and their sustainable management – a challenge or opportunity for EU policies and research? 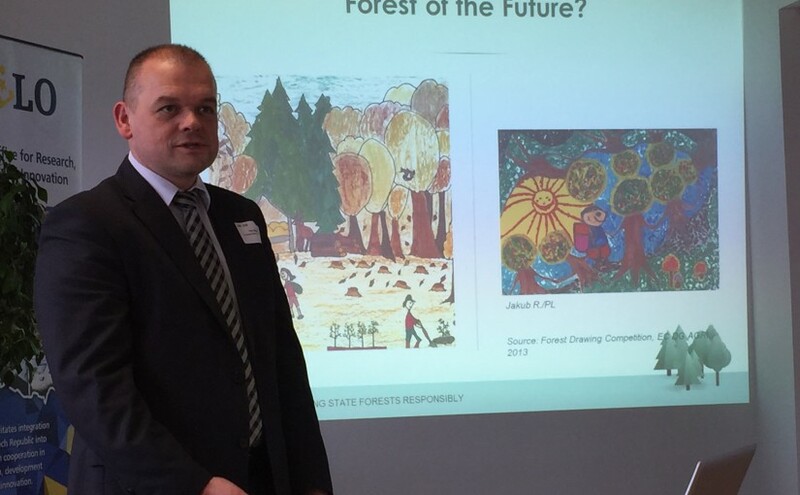 The Czech Liaison Office for Research, Development and Innovation (CZELO) organized a seminar addressing “Future of the Forest – Czech contribution to challenges for European Research and Policies,” on 2 June 2016 in Brussels. The aim was to discuss with forest-based sector stakeholders and representatives from different EU institutions and academia the challenges related to setting up future management objectives. Short- and long-term strategies for enhancing ecosystem resistance and resilience vis-à-vis climatic and environmental shifts, assisting forest ecosystems to adapt to variations in climate caused both naturally and by anthropogenic factors were also discussed. The role of research in advancing sustainable management practices, developing more resilient and resource-efficient value chains and integrating pest management strategies to counteract emerging diseases was reviewed in the context of opportunities provided by the Horizon 2020 program. Piotr Borkowski (EUSTAFOR) presented the perspective of state forests as regards the development of EU policies which are the most relevant for forests. Sustainable forest management is broadly practiced in Europe and results in significant expansion of forest resources throughout the continent. Sustainably managed forests provide a broad range of goods and services, including wood as a renewable resource for developing the EU’s bioeconomy. EUSTAFOR’s presentation is available here link. Further information and conference documents are available at the Conference website.